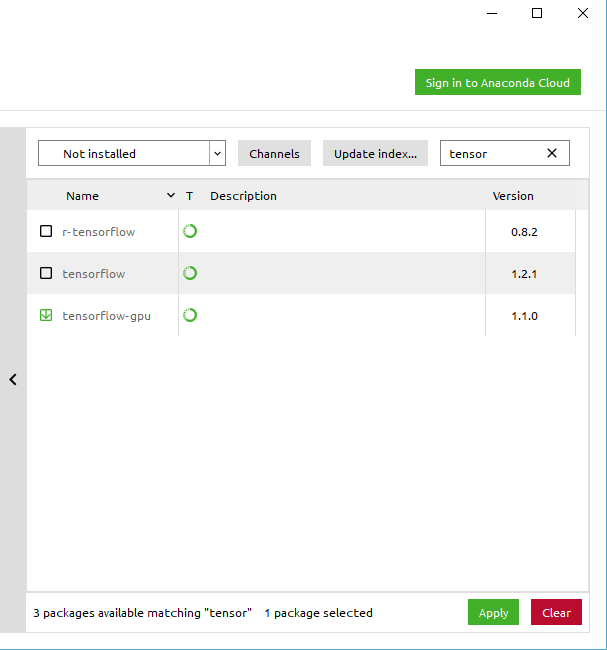 Before we actually start the installation process of the GPU-accelerated Python API of TensorFlow on a Windows platform, we shortly outline what TensorFlow actually is. TensorFlow is an open-source software library for machine learning that was originally invented by Google’s Brain Team but the code was open sourced in November 2015. It comprises a collection of resources for flexibly defining machine learning models, train them with data, and exporting them for further use. In particular, TensorFlow is useful for building and training the different types of neural networks. TensorFlow is available on several desktop platforms such as Windows, Linux and macOS as well as on mobile computing platforms. TensorFlow can run on multiple CPUs and GPUs (with optional CUDA extensions for general-purpose computing on graphics processing units). TensorFlow provides APIs for Python, C++, Haskell, Java, Go, and Rust. Third party packages are available for C#, Julia, R, and Scala. How to install TensorFlow on Windows? The installation of a GPU is usually straightforward in Windows. We therefore skip this part completely. TensorFlow’s official installation guideline provides a not that comprehensive description of the installation process. We therefore provide a more elaborated and detailed description, which should be understand as a supplementary to the official guidance. well as cuDNN Installation Guide. 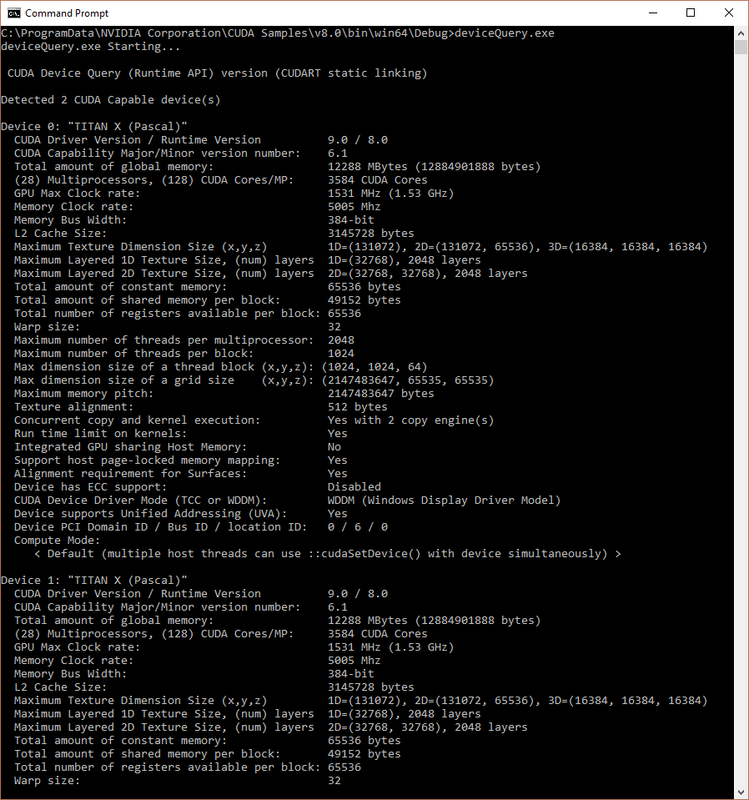 To this end, I recommend to install the version 8.0 of the CUDA toolkit and version 5.1 of cuDNN as listed below. Please ensure that the path to the file cudnn64_5.dll (for the cuDNN version 5.1) is set as displayed in the selected variable of exhibit “Path System Environment Variables for CUDA and cuDNN“. In addition, make also sure that “.DLL” files are included in the PATHEX variable. Finally, I highly recommend to validate your C++/CUDA installation. 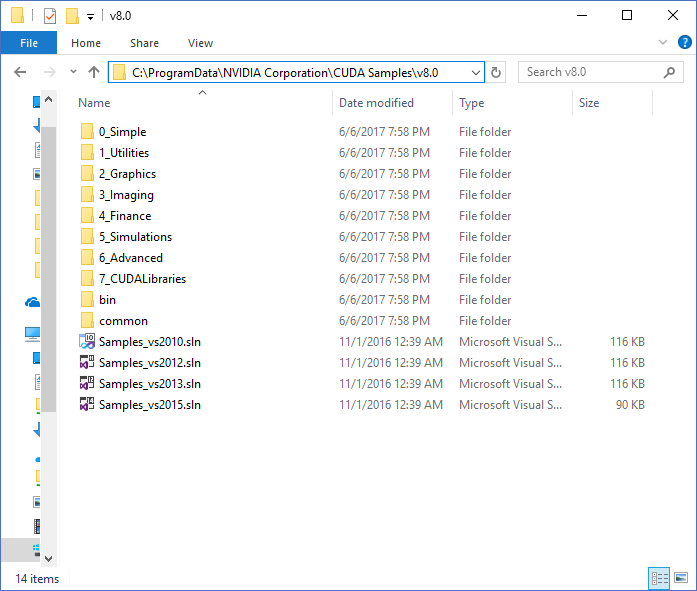 Click the Windows start symbol and browse through the programs to find the Nvidia Corporation folder. Open the entry that is called Browse CUDA sample. The standard installation path of the CUDA samples is given in the following exhibit. 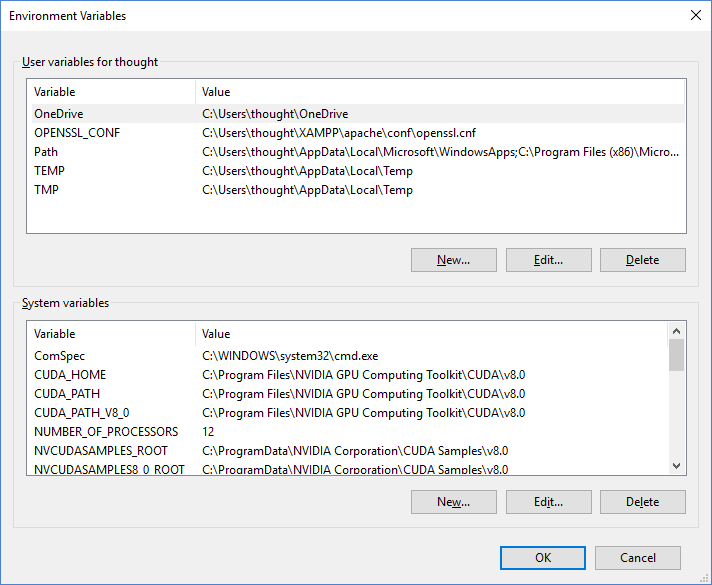 BTW, you can use this little program to request detailed information about your GPU. For instance, the exact number of CUDA cores, the memory clock rate and the total amount of global memory are listed. 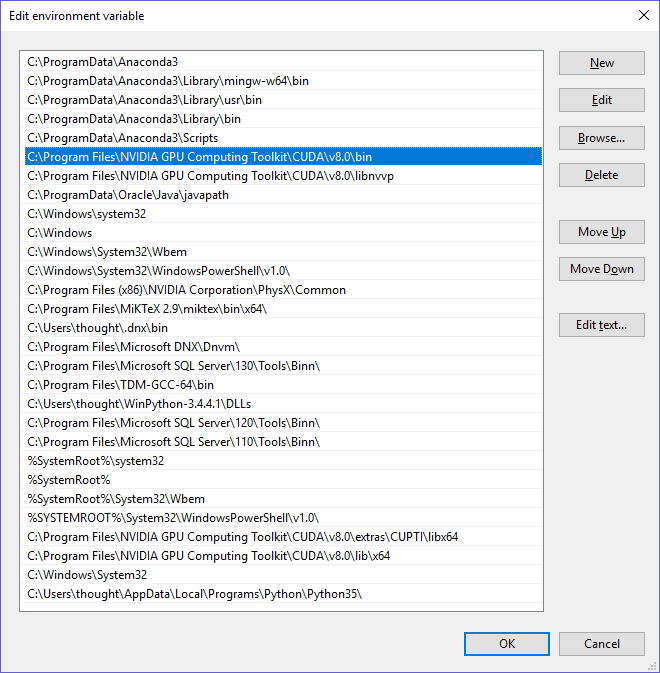 If you would like to chose another suitable program to check your CUDA system feel free to do so. There is, for instance, a folder 0_Simple\simpleMultiGPU that you can also build and execute to double-check the CUDA installation. One possibility how to validate the cuDNN installation is described in this stack-overflow post. After the long preparation phase we can finally install Python on Windows. There are several ways to install Python. I recommend to install the latest version of Anaconda Python framework. Even though the installation of Anaconda via the installation routine may be straightforward, I suggest to double-check whether the PATH variable (please see above) is set correctly. 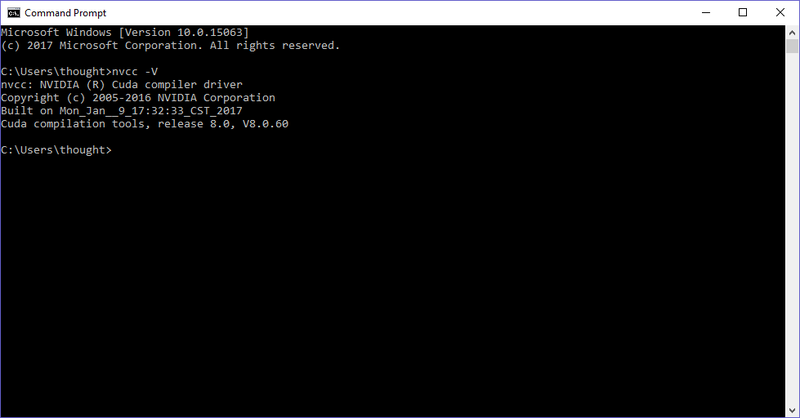 You can double-check this by executing python in a command prompt. After the installation of Anaconda, we first create a new Python environment to encapsulate the installation from other Python projects. This can be either done via Conda commands (conda create -n tensorflow-gpu python=X.Y.Z) or via the graphical interface of Anaconda. Second, we need to install the package tensorflow-gpu. 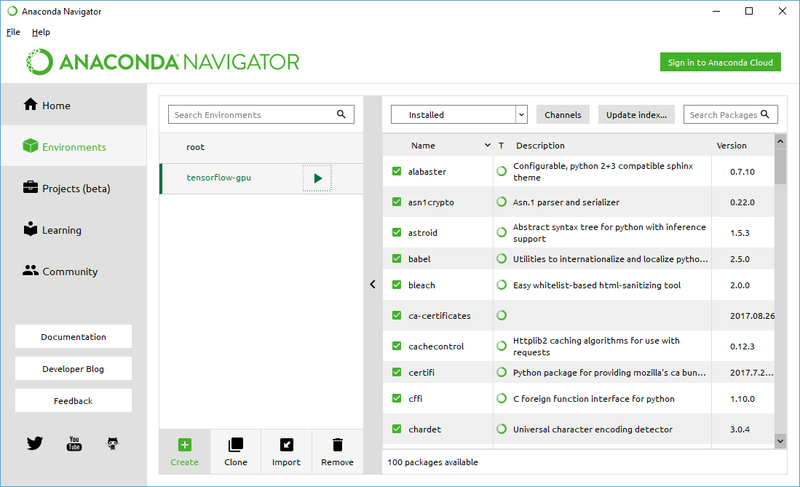 In order to create a new Python environment using Anaconda Navigator we simply need to click the “Create” button and name the new environment. The respective button is highlighted in the exhibit above. Alternatively, we could also use the command box executing conda install tensorflow-gpu. We can activate an environment by clicking the symbol on the right of the environment. After pressing the “Apply” button the respective packages will be installed. Alternatively, we could also use the command prompt executing conda install tensorflow-gpu. Previous PostPrevious What is an Empirical Copula?